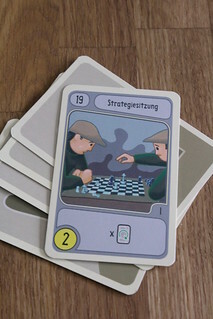 For his 2012 release, Friedemann Friese became exactly what the title of his game says: a copycat. The same can be said about the German title Fremde Federn – Borrowed Plumes – that he is clearly adorning himself with. How so? That’s the secret of Copycat, the newest game from Friese’s Friday project: he took the ten highest-rated games on BoardGameGeek and appropriated some of their core mechanics to mix into a new game. While the original plan may have been to incorporate all ten top games, the resulting chaos of mechanics would have been too much for anyone to create a coherent whole from. So Copycat takes two main mechanics to mix together: worker placement from Agricola and deck building from Dominion. But that’s not where the copying stops, FF went on to have some fun with the idea: the score track around the game board has the famous counting error from Ticket to Ride, going 90 – 92 – 93 – 94 – 93 – 95 and the box cover is a Friedemann version of the Barack Obama HOPE campaign poster. Especially that last allusion is appropriate: in Copycat you run your own campaign, pulling all the stops to be the most popular candidate at the end and be elected … something. President of the Game, maybe. However, to get there will take some work, because you start with only three campaign workers and a deck with some media attention (victory poins) and some financial backing – the Fatherly Friend cards in the starting decks, providing your initial funding, incidentally contain a hilarious easter egg in the artwork: their luxury cars have different famous TV space ships as hood ornaments. It’s a little thing, but it really made my day when I saw it, a big thumbs up to artist Harald Lieske. Just like basically every other deck building games out there, you start each round with a hand of random cards from your deck. But unlike every other deck-building game, you also start with your workers. 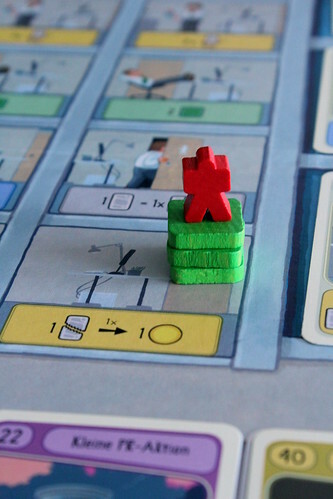 When it’s your turn, you place one of your workers in an office on the board. That doesn’t have any immediate effect other than claiming the office as yours for this round. Before and after placing a worker, you may play cards from your hand and activate workers already on the board. Both cards and offices are conveniently color coded: in this phase, blue and purple cards/offices are usable, they are action cards. Yellow and green cards represent money and victory points to be played in the next phase, gray cards are special and can basically be played whenever. Cards and offices are not fundamentally different, they offer many of the same actions except one: the actions to buy more cards are only available in the offices, never on cards. And so the round goes, placing workers and using actions, until all workers are on the boards. In the first round, none of your options are very interesting, really – just like any other deck-building game, your only real goal is to buy one or two cards to make the next rounds better. And that’s what you do: once all workers are placed, you put down your remaining cards and, if you got a buying action, use the money revealed to buy cards from the street. If you didn’t get a buying action your best option is to wail in despair and cry for a bit, because not buying new cards in a deck-building game is obviously a death sentence. Unlike Dominion, in Copycat there are no piles of identical cards to buy what you want from. Instead, there is the street – a long line of different cards where buying the ones near the start is cheap and the ones near the end is more expensive. As an added cost to buying cards further in the back, you have to take all the red qualification cards before it, cards that do nothing except clutter your deck. Those cards include things like drivers licenses, high school diplomas, university degrees – they all show the picture of a printed roll of toilet paper. All they do is clutter your deck. So qualifications only slow down your career as a politician, sounds like somebody’s political views are shining through here. Other cards are more useful, including the basics you’re used to from the genre: more money, more victory points, drawing more cards and a bit of deck management. To make the bridge to the worker placement mechanic, some cards interact with that part of the game. Most prominently, they grant you additional campaign workers for one round, but the ability to place a second worker in an occupied office is not to be sneezed at, either. The two base mechanics are integrated well in Copycat: you have cards to give you workers, you have worker actions to repeat card effects, you have to use both parts of the game, and how one influences the other makes sense. There is no set order to the cards, but they are split into four phases and arranged so all phase one cards show up before all phase two cards and so on – and while phase one cards are pretty harmless, the cards’ power escalates quickly and phase three and four cards are mighty useful indeed. So useful, in fact, that most of them could be seen as overpowered – but really, when all the cards are overpowered, then there’s no problem and unlike some other reviewers, we didn’t find any card to be game-breakingly more powerful than the others. The cards could, however, do with some more variety: all cards are always in play and the possible effects are not so numerous. A dash more Dominion, increasing replayability by having different cards available every game, could have been good here. With the card effects as they are, building your deck is an interesting part of the game and requires some strategy. Playing the cards from your hand is not as strategic, though: since you can always play all your cards, you rarely have to decide, just take it all. The only exceptions are the deck management cards and the Strategy Meeting that lets you keep hand cards for the next round. That’s not to say that there is no strategy involved in Copycat, of course. How you build your deck is full of important decisions, placing your workers has the usual dilemmas of that genre – which actions to pick before someone else can get them, what to do after someone else did get them – and, not least of all, the start player auction where the player who discards the most valuable card goes first. First choice of action, first choice of what card to buy, losing your most powerful tool in the process – yup, not an easy one. But nevertheless, Copycat also needs a good deal of luck to win: if you don’t get a high card when you really needed to go first – tough luck. Lacking one money to buy the card you wanted – tough luck, especially when it was the last one of that type. Drawing most of your deck and still not getting your one copy of the card that doubles your money – tough luck. Of course luck is always a factor when you draw cards, but the limited supply of powerful cards makes it hard to stack your deck the way you want. More than once in our test games we had players not draw that amazing card they bought two rounds before the game ends. That’s frustrating. So what is Copycat, in the end? It’s definitely more than a mere copy of mechanics, it’s a solid game in its own right, taking (mainly) two ideas and creating something new from it. At the same time, it’s not quite up there with either of its big role models, it doesn’t have the same replayability as Dominion or Agricola – or Power Grid, for that matter, Friese’s own game that is still in BGG’s Top Ten many years after its release. But Copycat still fun to play and proves that both worker placement and deck building have not reached the end of innovative possibilities yet. Next Post:Meople News: I veto that Blessing!